The owners of KFC are taking legal action against Iran in a bid to shut down "illegitimate" imitation chicken shops that have cropped up in the Islamic Republic, according to a corporate spokesman. The fast-food chain’s parent corporation, Yum! 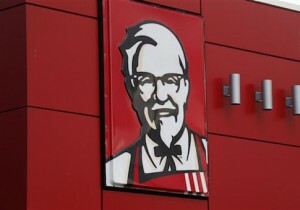 Brands, said that it is in contact with "local authorities" in Iran and is gearing up to take legal action to force the closure of the unlicensed KFC outlets in Iran, a spokesman said in a statement provided to the Free Beacon. The threat of legal action comes following reports that knock-off KFCs had been spotted in Iran bearing the company’s trademarked logo and an image of Colonel Harland Sanders, the franchise’s founder . Iranian authorities reportedly shut down at least one of the imitation fried chicken shops in Tehran last week. KFC is now prepared to take legal action, although it remains unclear how the Islamic Republic will respond to the corporation’s threats. "We were shocked with the news that an illegitimate KFC outlet opened in Tehran, Iran," a Yum! Brands spokesman said. "No franchise rights have been granted to any party in Iran." The parent company is currently "in contact with local authorities and external advisers and will be filing a legal action against any company or individuals claiming to have rights to open KFC," the spokesman said. The shuttering of the imitation KFC last week by Iranian hardliners comes amid a larger crackdown on American entities and others deemed too Western. While Iranian sympathizers promised that the recent signing of a nuclear agreement with Iran would moderate the nation and pave the way for increased business relations, Iranian officials have taken the opposite approach. Supreme Leader Ali Khamenei has banned all future negotiations with America and also launched a boycott of all U.S. goods. The KFC controversy is emblematic of Iran’s renewed effort to inoculate the nation against Western, and particularly American, influences. The imitation KFC that was shuttered last week reportedly bore too much of a resemblance to the American franchise and sported paintings that too closely resembled the U.S. flag, according to reports. "One wall inside the fried chicken store was painted in stripes that too closely resembled an American flag and the overall decor inside had too much of a USA flavor," Iranian state-media reports claimed. "Police are now telling the [state-controlled] Tasnim the closure is over a licensing issue," the New York Post reported. The supposed owner of the "Halal KFC" said that the Iranian branch was closed as a result of a "misunderstanding," according to Iran’s state-run PressTV. "The shutting down of KFC Halal was due to a misunderstanding," Abbas Pazuki, the owner of KFC Halal in Tehran, was quoted as saying. "We are part of a brand known as KFC Halal, which comes from Turkey. It belongs to Muslims and its target market is Muslim nations." The president of Iran’s Guilds Chamber, Ali Fazeli, claimed that the restaurant looked too similar to the KFC stores in America. "This restaurant had used the logo and symbols that resembled those of the American KFC in order to guarantee high sales," Fazeli was quoted as saying by PressTV. "This is a violation of the laws," he added. Knock-off KFCs have long posed a problem for the Islamic Republic and have become a symbol of the tug-of-war between Western-style outlets and the country’s hardline elements. In 2012, multiple media outlets hailed what they claimed was the opening of the first official KFC in Iran. However, that report turned out to be false. KFC was forced to issue a statement denying that it is in any way linked with the imitation outlets. It also threatened to take legal action against those operating copycat KFCs.